What follows is a lengthy description of what led me to embark on this new project. Click here if you’d like to skip directly to the event details. It’s been a long time since I publicized anything that I’ve been working on in the studio. If I’m honest, there was a period of time where I really just wasn’t working on much, and many periods of time where I just wan’t happy with what I was creating. Sometime within the last year or so, that all changed. Some, she knew the answers to. Others were met with her best guess. But she did a great job of explaining what she knew about creating music, as a huge music fan and consumer. I was extremely intrigued. I began experimenting with production when I was about thirteen years old. This happened to come at a time when I was beginning to discover the roots of punk, reggae, hip hop, and electronic music… nearly simultaneously. Concurrent with this, I was becoming really interested in synthesizers, because of their ability to generate non-acoustic (unrealistic) sounds from scratch. That fascinated me deeply, and I started learning trigonometry soon afterward because of its applications involving sine waves. Unfortunately, hardware synthesizers were quite expensive at the time, and there was no way I could convince my parents to help me buy one. However, it was right around this time that consumer-grade computers were just beginning to become viable tools for making music. Early experiments with software like Hammerhead (a drum machine), TS-404 (an analog emulation synth), and FruityLoops (a primitive step sequencer) taught me a lot about signal generation and processing. That’s how I cut my teeth in production, using cheap / free / pirated software to learn the process without breaking the bank. Years later, I would work for FruityLoops (later renamed FL Studio), producing demo tunes and tutorials for the software package. I also did beta testing work and patch design for VAZ Modular, which allowed me to learn about modular synthesis, even though I didn’t own much hardware. Back to reggae: I first heard Lee “Scratch” Perry around age 14. I can’t remember who pointed me in his direction, but I know that the first track I ever heard from him was a dub called “Noah Sugar Pan.” It’s actually a version of the Congos’ “Ark of the Covenant,” but I had literally no clue at the time that there even was such a thing as an original undubbed tune. I had brought home this CD from Jack’s Music in Red Bank. At the risk of sounding like an old man, it was both stressful and exciting to buy music at that time. There was no way to audition what you were buying, so popping it in the player at home was a nerve-wracking and thrilling experience. When the drum intro fired and the bass dropped, I thought I had lost my mind. I could hardly believe this was music produced in the 70s. The internet wasn’t quite what it is now, so it was difficult to find information on artists and releases. Digging through the mysterious shroud of history, I was able to find some hints about his process and style. One of the sources I remember was Mick Sleeper’s Upsetter website, which had some weird interviews and other tidbits about Scratch. After I learned that he did all of those classic recordings at the Black Ark on a four track recorder, I decided I could probably find an affordable one for myself. Eventually, I started using the computer in conjunction with analog recording. And a few years later, after saving up all of my money, I bought my first analog synthesizer – a very strange one made by a tiny independent Swiss company. I didn’t have a laptop, so I used to do local shows by hauling around my heavy CRT monitor and computer tower along with a few pieces of analog gear, and a MIDI interface. I don’t really think many people were too interested in the music itself; it was mostly experimental electronic music influenced by artists like Aphex Twin and Autechre. But people were clearly intrigued by the setup itself and the process of creating these sounds. So here’s the genesis of my whole approach: equal parts engineer and musician. I really wanted to make music, but I was also deeply interested in how to generate sounds as well. I proposed a new curriculum at the University of Maryland, and began teaching a course in production and synthesis in the then-new electronic music laboratory. After earning my degree in electrical engineering, I returned to NJ briefly and quickly moved to Brooklyn. In the years that followed, my love for hip hop grew exponentially. I was particularly amazed by the talent behind the boards; producers like Pete Rock, Dilla (Jay Dee), DJ Premier, Ali Shaheed Muhammad, and Madlib resonated deeply with me. Their ability to recontextualize otherwise corny or forgotten songs and repurpose ordinary snippets inspired me to try my hand at sample-based production. This led to the release of a few remixes, mixtapes, and a few albums with Ryan-O’Neil. I was DJing bars and small clubs in the city a few times a week. While it was exhausting, I learned so much about how to set a party off and keep it going. I mostly played hip hop, R&B, and soul… but whenever I felt a signal from the crowd, I would pepper my set with reggae classics (and if I felt really lucky, 90s dancehall). Looking back, I was slow to realize it… but I was chasing the ghost of a hip hop scene that was dying. What I found alive and well instead, almost by accident, was an incredibly varied group of musicians playing Jamaican music in different combinations. Following this period, I really doubled down on collecting reggae records. I used to shop at Jammyland on day trips before I ever lived within the city limits, and that was a great resource. 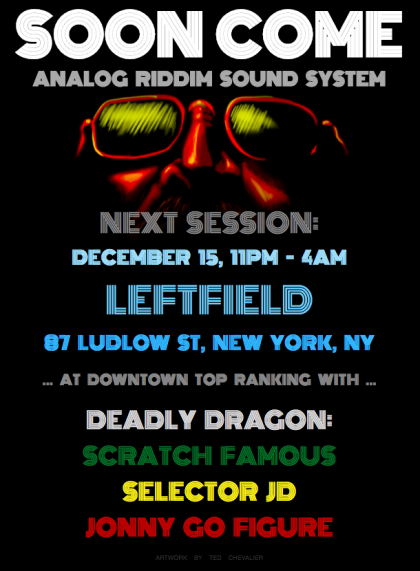 Deadly Dragon Sound then took the torch from them as the only reggae shop in lower Manhattan. Scratch Famous (its owner) was so instrumental in nurturing my instincts to collect tunes by riddim; every time I thought I maybe had the full breadth of productions and vocal takes on a particular riddim, he proved me wrong by putting another 45 in my stack. It was addicting to discover so many different permutations of the same building blocks, and a good portion of my reggae collection today is still organized by riddim (as opposed to sorting by artist, producer, or label). Spinning records alongside veteran selectors like Carter Van Pelt, Agent Jay Nugent, and Chanter (who runs the sound system for Coney Island Reggae every summer) was crucially informative as well. Furthermore, the rise of Discogs made discovering vintage vinyl much easier, compared to using strictly eBay in the 90s. So how was I going to find the stimulation I needed? Fast forward to this moment. Many years (and many sounds) later, I’m embarking on a new project that I feel really encapsulates all of my influences and experiences so far. It’s called Soon Come – a bit of a joke, since I’m a known procrastinator. With my partner Monika, who also has a deep appreciation for reggae music, I’ve been trying to do my part to map out the DNA of tunes we love in a novel context. The aim is to produce new versions of common foundation riddims from Jamaica’s nearly-infinite vault of musical culture, and perform them live using analog synthesizers. We want to create a solid platform for vocalists and instrumentalist to interact with, even if they’ve never heard our versions before. Using riddims whose reputations precede them as a model, we can achieve this in fine style. Anyone who’s heard “Real Rock” or “Full Up” before can recognize when it’s reprised, no matter how many years have passed since the glory days of Studio One in Kingston. Our recent trip to visit this Mecca of reggae music has made us more excited than ever to share these sounds with you. 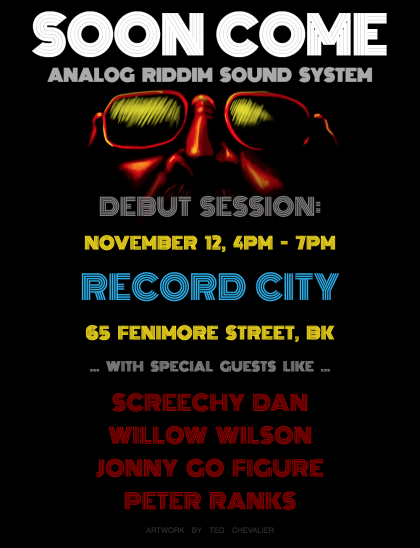 Please join us this Saturday at Record City for our debut. We’ll have a talented pack of vocalists with us: Screechy Dan, Willow Wilson, Jonny Go Figure, and Peter Ranks are all set to grab the mic and chat. 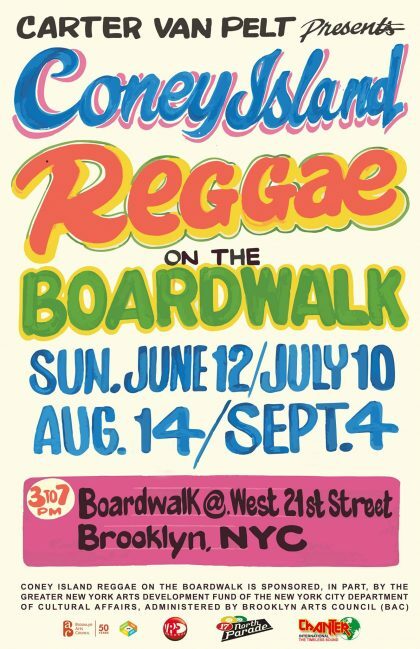 This Sunday marks the second of four Coney Island Reggae sessions on the boardwalk. I’ll be kicking things off at 3pm sharp this time, with a heap of familiar faces to follow. Stick around after my opening set to hear great sets by Mumma Lioness, DJ Wicz, Rob Kenner, Scratch Famous, Max Glazer, Chanter (who strings up the sound system every year), and the great Jah Wise. 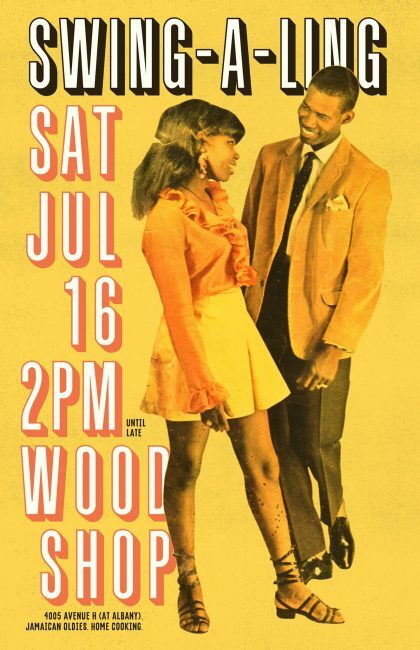 The following Saturday, I’ll be joining the Swing-a-Ling posse & friends to play records in a yard, with Jamaican oldies 45s and some home cooking. This is what July in Brooklyn is all about! June is already around the corner, and for me that usually means plenty of visits to the beach. 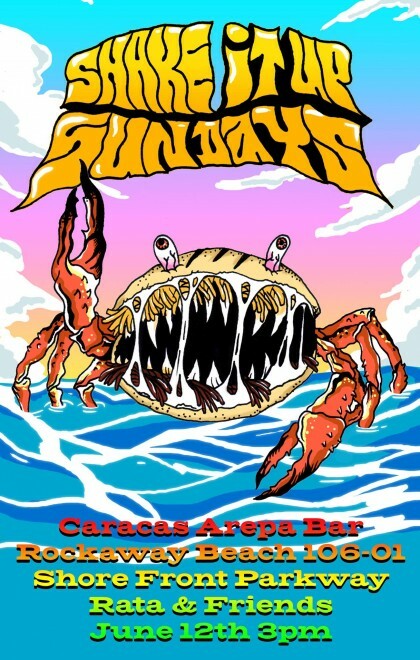 Selector extraordinaire Rata kindly invited me and Grace of Spades to binge on arepas and beers with him, while we play vintage vinyl all afternoon. Please join us a few Sundays from now at Rockaway Beach!